Dozens of war protesters were arrested Friday afternoon, April 22 outside the main entrance of the New York Air National Guard’s base at Hancock Field. Thirty-seven protesters, draped with red-spattered sheets, had lain themselves in the main entrance roads to the base, off East Molloy Road. They were arrested by Onondaga County Sheriff’s deputies on charges of trespassing and obstruction of justice. They were handcuffed and, after a 45-minute wait, were led to a jail transport bus that was supposed to take them to the Onondaga County Justice Center for processing. Two were in wheel chairs. 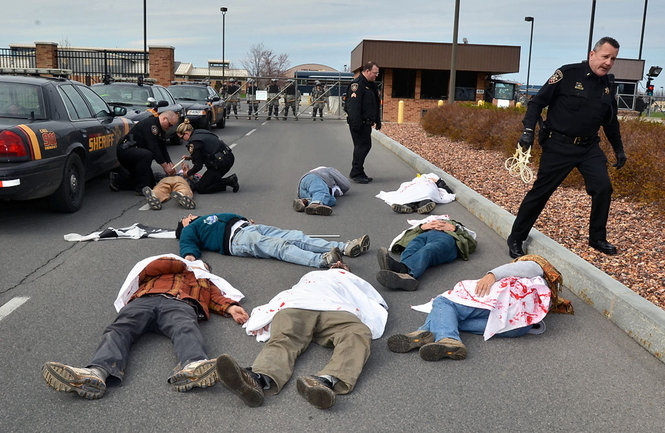 The arrests followed a rally outside the air base where more than 150 people had gathered to protest the MQ-9 Reaper drones, and U.S. military involvement in Iraq, Afghanistan and Libya.